Following the publication earlier this year of a report from the Organisation for Economic Co-operation and Development (OECD) on Czechia, the Ministry of Health announced that the findings of the report confirm the country’s health reforms are on course. The Ministry of Health organized an event on 5 November 2018 that gathered over 100 representatives from the health sector, other ministries, as well as the Chamber of Deputies and the Senate of the Parliament. 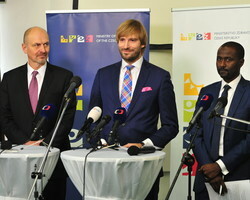 There, Health Minister Adam Vojtěch commented that the OECD recommendations are in line with the positions and existing strategies of the Ministry of Health. “This is a clear signal to me that we have taken the right course in health-care reforms,” he continued. Calling it “one of the most extensive analyses produced by an international organization in recent years”, the Minister welcomed the publication as a source of useful recommendations. He noted that it serves as a basis for further professional and political debate to ensure the long-term sustainability of the health-care system, and to address the country’s main public health challenges. Czechia has already achieved near-universal health coverage (over 99%) with a wide array of services and with the lowest rate of inequity in health in the WHO European Region. Out-of-pocket expenditures in the country remain among the lowest of OECD member countries. However, as it faces a rapidly ageing population, low unemployment and a shortage of skilled labour, the country will need to address projected increases in health expenditure by increasing revenues for health and productivity in the health sector. Strengthening primary health care, expanding the role of general practitioners to include a gate-keeping function, improving the management of medical services – including through innovative reimbursement models – and increasing the integration of adequate services for chronic diseases and the ageing population may contribute to health-cost containment and better health outcomes in the future. In his address, Dr Srdan Matic, WHO Representative to Czechia, stressed the importance of the health sector promoting health-enhancing policies in other sectors. For example, more than 80% of the country’s health workforce is female, but the rate of return to work after having children is low; investments in early childhood education and child care services would therefore contribute to reducing chronic shortages in the health workforce. Investments in medical studies would also increase the number of nurses and doctors entering the workforce and ensure lifelong training of practitioners. WHO supports and closely collaborates with the Ministry of Health on the country’s reform agenda in the health sector, focusing on integrating health services, digitalizing the health system, strengthening primary health care, reforming public health services and addressing the main determinants of health in the country, including tobacco use, alcohol consumption, obesity and exposure to environmental threats.